This is one special property! 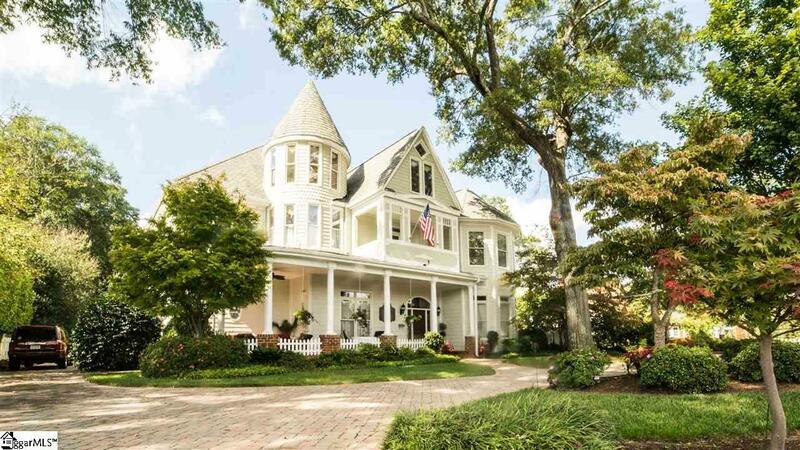 An amazing home on 1.12 acres in Downtown Simpsonville. This large family home is within a short walk to the shopping and dining of charming, historic Downtown Simpsonville - coffee, ice cream, pizza, craft beer - you name it. 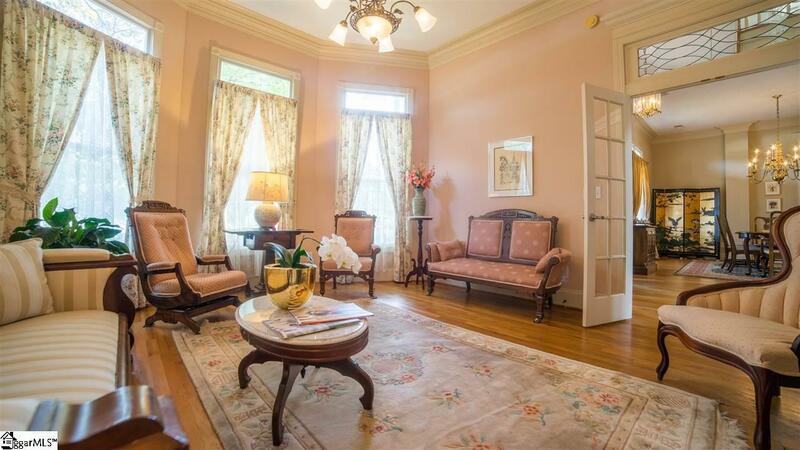 Formerly, the highly adored Garden House Bed & Breakfast, which operated since 2003. This special home offers an amazing opportunity to a new family. The current owners are retiring after many beloved years of hosting guests from all over the world and serving as the site of many beautiful weddings. The original small home on this property was built around 1905, while a major renovation and addition was finished in 2001, growing the home to over 7000sf with 5BR, 7.5BA and a third floor recreation area (or owners suite). The massive back porch overlooks the gorgeous yard and gardens for which this home is known. The yard extends deep into a magical woodland garden with towering trees, wildlife and pathways. 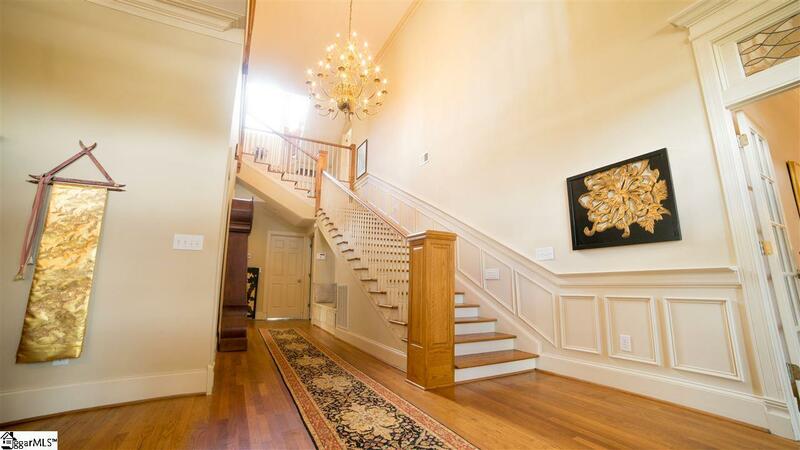 The front door welcomes you to a huge foyer area with soaring ceilings. 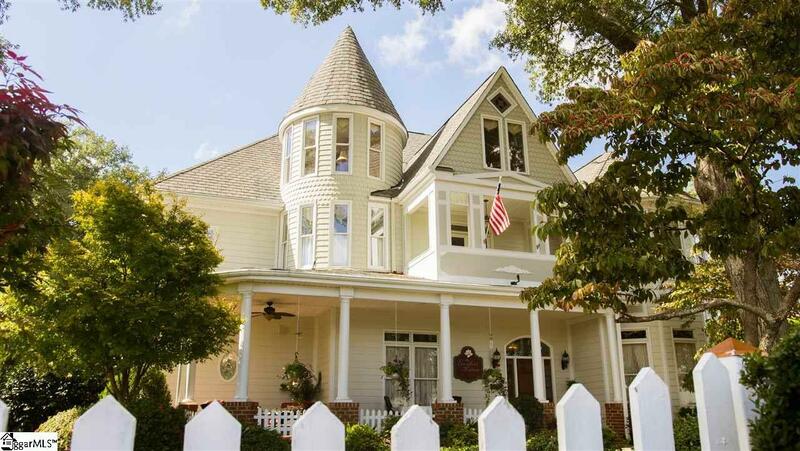 The main level has grand 11 ceilings, a large dining room, parlor, laundry and massive great room with casual dining with three sets of double doors to the covered porch. The gourmet kitchen offers a 6-burner gas range, ice machine, wine fridge, warming drawer, walk-in pantry and room for four stools at the counter. Also on the main level is the master suite with French doors to the covered porch, dual vanity, gas fireplace, jetted tub, walk in shower, water closet, his & her walk in closets and new quartz countertops. The second level offers four private ensuite bedrooms and a cozy study/lounge with two full walls of built in book shelves. The top floor is reached by another grand double staircase leading to a large space that can accommodate a recreation area or double as an additional 6th bedroom with large walk-in closet and sewing room. Outside youll find a potting shed with power and water, 2-car detached garage and additional parking with river rock. The entire yard is irrigated. There is parking for up to 20 cars on the property. Convenient to so much including I-385, Heritage Park, Hillcrest Memorial Hospital and Fox Run Country Club. Downtown Greenville is a 20 minute drive.